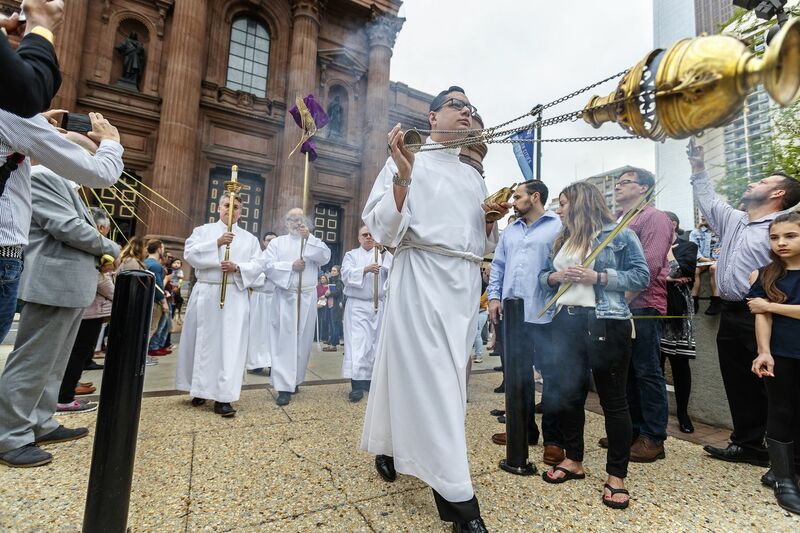 Altar server and thurifer, Adam Erdosy, swings the thurible, which contains the smoking incense, as the procession of priests makes its way through the Palm Sunday congregation gathered in Sister Citites Park to begin the Palm Sunday celebration at the Cathedral Basilica of Saints Peter and Paul on April 14, 2019. Christians across the Philadelphia region, and world, today celebrated Palm Sunday – the official start of Holy Week that culminates with Easter. For followers of the faith, each day this week commemorates a key event leading up to the death and resurrection of Jesus Christ, collectively known as the passion. Palm Sunday memorializes Jesus’ arrival in Jerusalem on a donkey. The Bible describes how supporters greeted Jesus by laying palms on the ground before him. Christians took home palms blessed by their priests at mass where they are traditionally affixed to crucifixes. Ravi Sheth, center, holds up his palm frond that has been shaped into the sign of the cross at the Cathedral Basilica of SS. Peter and Paul during the 11 a.m. Mass to celebrate Palm Sunday on April 14, 2019. Holy Thursday commemorates the Last Supper. During the meal, Jesus predicted the betrayal that would lead to his death as well as his resurrection. At the Cathedral Basilica of Saints Peter and Paul in Philadelphia, Archbishop Charles J. Chaput will celebrate 7:30 p.m. Mass, and will wash the feet of 12 seminarians from Saint Charles Borromeo Seminary, following an example set by Jesus at the Last Supper. Good Friday is the somber observation of Jesus’ crucifixion and death. This year, Good Friday coincides with the start of Passover, when Jews celebrate their liberation from slavery in ancient Egypt. Many Christians fast on Good Friday and perform stations of the cross, a ritual that invites believers to reflect on key moments that occurred throughout the day of Jesus’ death. It all leads up to Easter Sunday, the holiest day of the year for Christians, which some denominations will begin celebrating at sundown on Saturday.